A large-scale study found that aerobic exercise was associated with improvement in executive function and increases in cortical thickness. Importantly, the effects were mediated by age — the effect was more pronounced in older participants, suggesting that the exercise may mitigate age-related declines in executive function. Prior research has suggested that exercise can improve cognitive function in older adults, but a new study by researchers from Columbia University found it led to improvements in executive function for younger adults as well. From May 2011 through April 2016, researchers evaluated 132 people ages 20-67 and assigned them to exercise four times a week for six months, completing 10-15 minutes of a warm-up/cooldown and then 30-40 minutes of a workout. Only 94 of the 132 finished the full six-month intervention. One group was assigned stretching and toning exercises and the other aerobic activity. Each was assessed for executive function, episodic memory, processing speed, language, and attention. The only significant change was in the aerobic group's executive function. A key aspect of the study's protocol was that regular exercisers were excluded, with qualifying participants rated as “below average fitness” by the American College of Sports Medicine standards. Researchers measured the volunteers' VO2 max capacity, the numerical measurement of the body's ability to consume oxygen. Researchers also measured participants' cortical thickness. Dr. Stern, who is also director of the Cognitive Neuroscience Division at Columbia, said he had always been interested in lifestyle factors and their association with better cognitive function, particularly in the context of aging. But while he found many controlled trials that looked at exercise and cognition for people over 60, he could not find a large-scale controlled trial for younger people. Executive function “improved significantly” in the aerobic exercise section, moderated by age. At age 40 the executive function measure increased by 0.228 (standard deviation units) and by 0.596 (standard deviation units) at age 60. Cortical thickness increased with age, suggesting that the effect of aerobic exercise might contribute to brain health in people as young as 20. Independent experts who reviewed the study, which was published in the January 30 online edition of Neurology, said it was an interesting but not surprising result. And they questioned if the improvement would continue to increase with continued exercise, or how soon it would drop off if people stopped working out. Deborah E. Barnes, PhD, a professor of psychiatry and epidemiology at the University of California, San Francisco, said the study was conducted well, with a high level of evidence. “The results were consistent with studies of older people but it was exciting to see that benefits could be apply to a middle-aged population,” she said. She considered it disappointing, however, that the study did not show that exercise did not have a marked impact on memory, as that is a large concern among the general public as they age. “People know that exercise is good for them, and this study might be a motivator,” she said. Dr. Barnes noted that a majority of the study participants had a higher education level (the average was 16 years of schooling), adding that she would like to see the study replicated in a more generalized group. Sudha Seshadri, MD, FAAN, the director of the Glenn Biggs Institute for Alzheimer's and Neurodegenerative Diseases at the University of Texas at San Antonio, said it was a good sample and a thoughtful analysis with “hopeful and interesting” results. It is important to understand what types of exercise are most beneficial for the brain, she noted. But she was concerned that the findings might be due to chance as six cognitive domains were studied at two time points each, and while the results were significant after correction for multiple testing at 12 weeks, they were no longer significant at 24 weeks if one applied a strict multiple testing correction. The study findings will be more definitive if they are replicated, Dr. Seshadri said. Cognitive function tests can be affected by many things, even the greater alertness resulting from a few extra cups of coffee, Dr. Seshadri noted. “This is a group I enormously respect, and what they've done is a difficult and thorough study with a relatively low drop-out rate. It's not easy having people do the exercise reliably and then study the effects of that exercise in the detail in which they have,” she said. “It's a very strong study and I'd like to see someone copy this and see if their findings are the same.” All the experts interviewed remarked on the study's sample size, noting that recruiting participants for an exercise study is challenging, particularly one where they have to go four times a week, for an hour at a time. Eric McDade, DO, associate professor of neurology at Washington University in St. Louis, pointed out that it took the researchers four years to recruit volunteers for the 24-week study. He said that the fact that researchers also measured the VO2 capacity, as a more accurate measure of exercise capacity, was a reflection of how carefully they had made sure everyone started on the same level. He called the results “modest,” adding that it was not surprising that aerobic exercise improved cognitive function. But he questioned whether the improvement in executive function was solely due to exercise. Dr. McDade said it would have been interesting to have had a crossover, switching the aerobic group to stretching and vice versa at three months, because the increase in function peaked at the three-month level. This would have provided a sense of how long the identified improvements lasted, he suggested. Dr. Dade also pointed out that those in the stretching group had a higher VO2 capacity from the start and wondered if the results would have been more dramatic if the groups had been flipped or had started at the same level. He also questioned if the results would have been the same had participants worked out one or two times a week, which might have been more realistic for the general public to continue. One of the challenges, the independent experts said, is that many people do not exercise despite the many studies showing the benefits of doing so. The researchers said they hoped the study might encourage their younger patients to exercise, but the team were pragmatic about the possibility of long-term success. Dr. Stern received an honorarium from and has consulted with Lilly and Takeda Pharmaceuticals USA. He has also received an honorarium and travel-related expenses from Axovant Science and has received a licensing fee for the Dependence Scale. Dr. Barnes has a subcontract with Together Senior Health, Inc., to provide guidance on research methods for a small business innovation research grant from the National Institutes of Health related to a movement programs for people living with memory loss and caregivers. Dr. McDade reported no disclosures. •. Stern Y, MacKay-Brandt A, Lee S, et al Effect of aerobic exercise on cognition in younger adults: A randomized clinical trial http://n.neurology.org/lookup/doi/10.1212/WNL.0000000000007003 . Neurology 2019;Epub 2019 Jan 30. 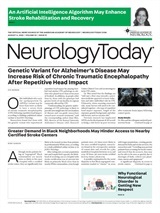 Neurology Today19(3):1,24-26, February 7, 2019.